Welcome to The Health Doctors, Ltd.
We are glad you have found us. Our aim is to be an office full of energy and love. 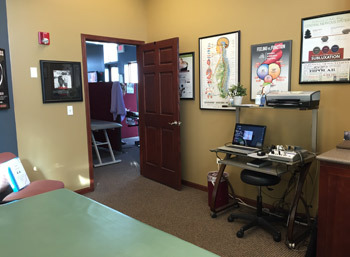 We are committed to bringing you better health and a better way of life by teaching and practicing the true principles of chiropractic wellness care in a family-friendly peaceful setting. At The Health Doctors, Ltd. we use a two-visit new patient process. Before you come in, we ask that you complete the online paperwork. This helps limit your wait time in our office. Upon arrival you will be warmly greeted by one of our amazing front desk staff, who will review the online paperwork and confirm we have everything necessary completed. 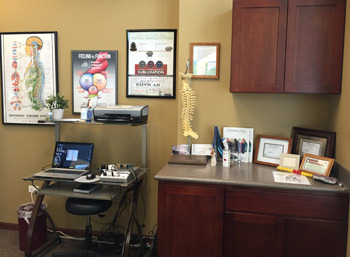 You will then be taken into an exam room and shown an informational chart to help you learn a little bit more about subluxations and chiropractic — don’t be surprised if Dr. Jim gives you a little quiz! We love educating our patients, and believe that it helps you understand exactly what’s going on in your body and what we can do to help you. You will then meet with an associate who will talk with you about your concerns and health goals. We will review your health history and explain how chiropractic wellness care works. The third component is likely the most important, and is begun once the consultation is done. This component is our comprehensive chiropractic examination. 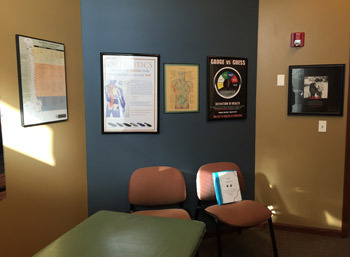 The exams done at our office are very thorough and expansive, allowing us to figure out exactly what is going on with your health, and what the true cause of your challenges are. We perform a computerized exam that allows us to measure the amount of stress on your central nervous system, which includes a nervous system scan, thermography scan and heart rate variability. These tests are the foundation of our exam. In an effort to help our patients, if you have a child with special needs that you feel won’t be able to sit through our intake process, we can schedule a new patient phone consultation to shorten the amount of time spent in the office during the first visit appointment. On your 2nd visit, our front desk staff will again greet you and get you checked in for your appointment. 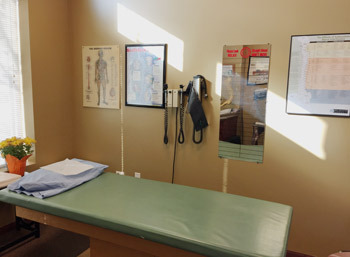 You will then be taken to the doctor’s office where one of our doctors will go over all the results of your examination. We refer to this as your Report of Findings. This is also the time where you have the freedom to ask any and all questions you may have. First the doctors will explain the results of the scans that were performed. The scans have 2-3 components depending on what was done, and each will be explained and related to your specific concern or condition. Again, this is the most important piece as you will be re-scanned on a very specific schedule in order to track and document your improvements. It is very important to us that you have a good understanding of what is going on with your spine and central nervous system, so again questions will be taken throughout the entire Report of Findings. Lastly, we will go over the details of your treatment plan and answer any and all questions you may have. Most treatment plans consist of two phases, and those will be explained. If any additional consultation, examinations, referrals, or any other form of additional testing is recommended, we will go over those as well. When your report is finished, you will then be taken to an adjusting room for your first adjustment. Once that adjustment is performed and you are on your way to improved health and wellness, you will then meet with our Billing Manager to go over the financial aspects of your care. The entire second visit should again take about an hour, and will finish with scheduling of your next appointments. Regular care visits take approximately 20 minutes. Our goal for our patients is to live a healthy and happy life while understanding the benefits of what chiropractic care can do to help you maintain that. Most of our patients choose to visit us on a regular basis for care to prevent dis-ease from recurring after they’re feeling better, and we hope you’ll consider that as well after learning more about how chiropractic care works in the long run. 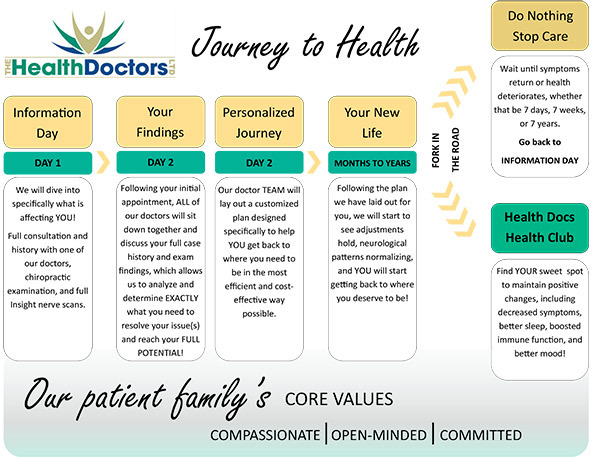 Contact The Health Doctors, Ltd. today to book your first appointment for yourself or your family. We have years of experience helping people of all ages reveal their inner health—from giving babies the best start in life to helping seniors repair years of trauma, toxins and thought stressors.